Salmon became cut off in a pool after water poured over the banks of the river following two days of bad weather. Specialists from the Spey Fishery Board have already returned eight of the fish to their natural habitat after they were reported by a greenkeeper. 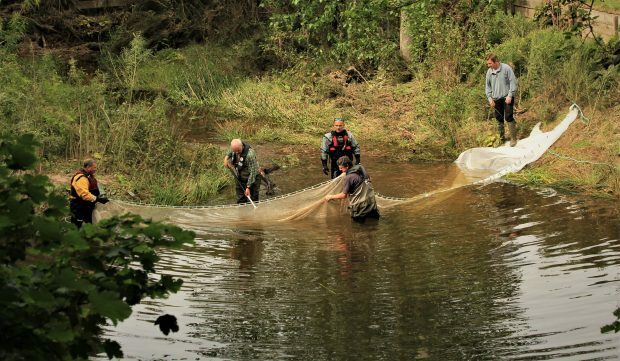 A group of men donned waders and descended into the pond to try and catch the salmon in a net before returning them to the river. Today, they will return to the Garmouth course with a different net in an attempt to catch the remaining sealife which have become trapped. The pool is connected to the river, which is about 200 yards away, by a small burn that is usually only inches deep. However, following days of heavy rain, the river burst its banks and swept fish across the course and into the pond. It is understood that up to 20 fish could have been cut off within the golf course environs. Roger Knight, director of the Spey Fishery Board, said: “The channel isn’t a path the river ordinarily takes, but when it bursts its banks, it’s known to go down this particular stretch of water, which is otherwise a dried-out burn. “During that time, a number of fish went down there. As the water has receded, it has left some pools, which they have not been able to escape from.